Flame Tree Press, 9781787580480, 240pp. As a girl, Jack lives with her father and brother after her mother passed away during childbirth. Her father is a well-meaning construction worker who treats her more like a roommate, while her brother, Andy, is an introverted loner prone to violent outbursts, a virtual mirror to his sister who is outspoken to an extreme. The story opens on a sleepover with nine year old Jack and her close friend. While putting on a pretend show, the two girls leave a video camera running, and when Jack replays the tape the next day, she sees her friend's toy being snatched off the end table and out the back door by a swift, nearly unseen hand. Excited and bewildered, she tries to show the tape to her thirteen year old brother, Andy who is still furious about the spat he and Jack got into the night before. Without another word, he smashes the tape of the intruder. That night, determined to catch the creature she now calls The Toy Thief, Jack sets up a series of traps, all of which fail miserably. Once she awakens in the middle of the night, she finds her friend's toy has returned, brought back by The Toy Thief, an impossibly tall and rat-like creature with glassy eyes. Just then, Andy steps out of his room, and as The Thief flees in a panic, Andy realizes his sister is telling the truth. The two of them are able to surmise that The Thief most likely travels through a tangled section of woods called The Trails, and they go out in search of it. After returning unsuccessful, Jack awakes the next morning to find Andy missing from his bedroom. As her father informs the police, Jack knows it's up to her to find him. Jack must venture into the dark place WHERE TOYS GO to get him back. But even if she finds him, will he ever be the same? FLAME TREE PRESS is the new fiction imprint of Flame Tree Publishing. Launching in 2018 the list brings together brilliant new authors and the more established; the award winners, and exciting, original voices. A fan of all things dark and horrific, D.W. Gillespie has been writing horror, science fiction, and fantasy for longer than he would like to admit. He began writing seriously in 2002, and after winning the MacDougal Award for his short story 'The Home', he's since been published many times in print and online. His body of work includes dozens of short stories, such as 'Man of the People', 'Drawn' and 'Heavy'. He's been featured in many publications, both online and in print, and he's the author of nine novels and counting, including Still Dark, Daylight Dims, The Tree Man and Circle of Mist. He lives with his wife and two children in Tennessee. What sort of monster features in this new tale? Well, do you ever wonder how things just seem to vanish from your house even though you knew where they were? Maybe a pack of batteries goes missing, even though you knew exactly where you put them? It might have been The Toy Thief. He's a creature that comes and goes as he pleases, gliding in and out of houses without ever being seen. The reason? To feed a hunger for innocence and goodness that can never truly be sated, like a junkie looking for his next fix. His drug of choice? Children's favorite toys. Any particular influences in this book? Beyond my family, I'd say The Toy Thief in general definitely has a Guillermo del Toro sort of feel to him. I'm not a visual designer myself, but I like to try to give just enough detail in all my books to let the reader fill in the blanks for themselves. 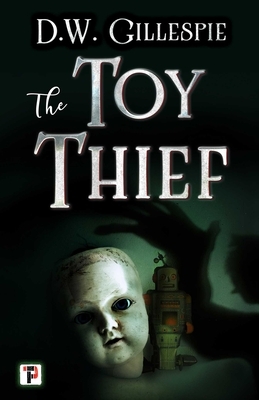 I would love to see someone with a style and imagination like Del Toro bring The Toy Thief to life.